Courtesy of JB Goodwin, REALTORS, Kim Nail. 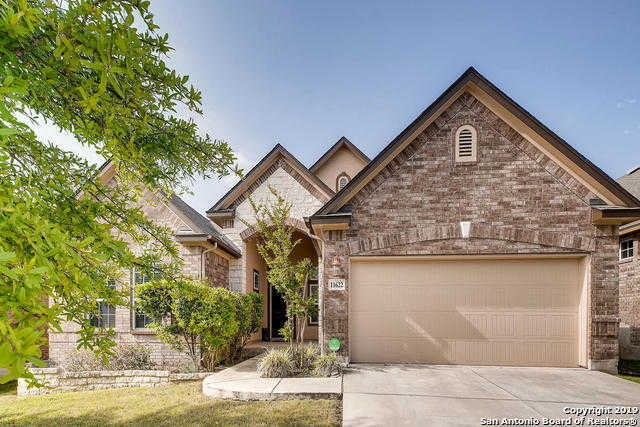 Beautiful 1.5 story, Alamo Ranch home nestled in the Trails gated community off Lone Star Pkwy. Split layout with all bedrooms down/Bonus room up! Soaring ceilings, SS appliances, granite, tile, carpet; Kitchen Mohen faucet, gas FP; 1 year-old water softener & dishwasher. In-ground sprinklers (front/back), covered deck. Security system, garage storage racks & much more. Easy access to UTSA, Lackland, USAA, La Cantera, The Rim. Don’t miss this jewel! Please, send me more information on this property: MLS# 1377162 – $292,500 – 11622 Hunter Ivy, San Antonio, TX 78253. I would like to schedule a private showing for this property: MLS# 1377162 – $292,500 – 11622 Hunter Ivy, San Antonio, TX 78253.